This little girl is on the ward right now. She is sassy and adorable. The cleft lip boy Iwas looking for. 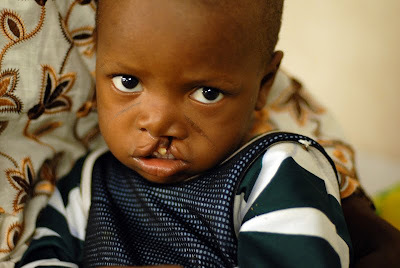 Last night I went down onto the ward looking for a cleft lip patient I want to write a story on. I was stopped when I came to the bottom of the steps that lead me into the ward. A boy, about 13, was standing in the hallway with his arms and legs spread out so they touched each wall. He was making a face similar to Gandolf's in Lord of the Rings when he shouted, "You shall not pass". I was not allowed through. He held his ground for about 20 seconds, and then, with a playful laugh, agreed to let me into the ward. He had obviously just had a max-fax surgery, as an NG tube was dangling out of his nose and a large bandage was wrapped around his chin. But that couldn't stop him from being silly. 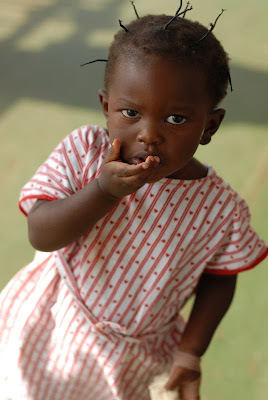 When I went into the ward, I didn't find my cleft patient, but I did meet another little girl. She is six and has a tumor, the size of both my fists, climbing out of her mouth. She keeps it covered by a rag so no one can see it (which is still completely noticeable). Becca, her nurse, told me she sits under the bed when she eats. Eating is a difficult procedure and she is far to embarrassed to allow anyone to see. I sat on her bed while Becca played with her. Earlier, she had colored what could have been an entire coloring book, and Becca was helping her tape her masterpieces to the wall. She was very particular in where they were placed, pointing to the spot she wanted and nodding her head in approval when they were securely attached. Before I left, we all went for a "march" down the hallway. As we marched, I looked to my right and saw a male patient my age marching with us. His was moving his arms and legs up and down with such seriousness and purpose, I had to laugh inside. Only here will you ever see that happen. It's pretty awesome.